I wrote about Rujm el-Hiri in a post on May 2009 and concluded with a variety of suggestions about what the structure may have been used for. Now Dr. Rami Arav who has been excavating at nearby Bethsaida since the late 1980s has proposed a new theory reported in the Nov/Dec issue of Biblical Archaeology Review based on a broader look at the local Chalcolithic civilization (4500-3500BCE) and on similarities he noticed with more distant cultures. Rujm el-Hiri consists of four concentric circles, the outermost more than 150 meters across, made up of an estimated 42,000 tons of basalt rock. Experts believe that these are the remains of massive walls that once rose as high as 8 meters (think of the ruins of the walls of the storehouses and the Roman camps at Masada). Excavations at Rujm el-Hiri by archaeologist Mike Freikman of Hebrew University in Jerusalem over the past five years have yielded almost no material remains of the kind that are commonly found at most archaeological sites. The lack of artifacts confirms that the site was never inhabited and so was not a town or fortress but most likely a ritual center — possibly linked to a cult of the dead. What is the reason to go to such great lengths to construct something that was never inhabited, whose location was not strategic? 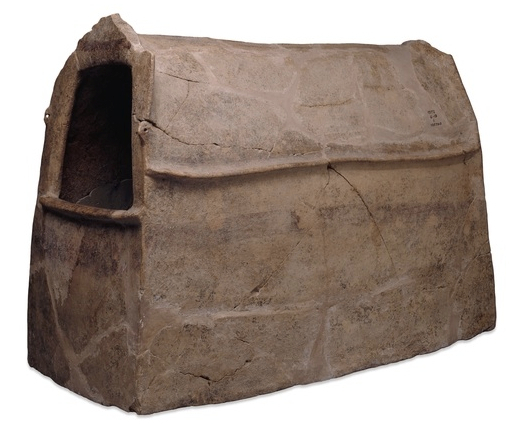 Burial in the Chalcolithic period was in ossuaries, small clay boxes used to house the bones. Stone ossuaries were seen next in the Second Temple period for Jewish burial – bodies were buried for an initial period of about a year in temporary tombs until the flesh decomposed and only the bones remained. In archaeology, this process is called excarnation. But archaeologists have not found evidence of such preliminary graves from Chalcolithic times. Arav found a clue in the treasure of Chalcolithic bronze artifacts discovered in a cave, in the cliffs above the Dead Sea. 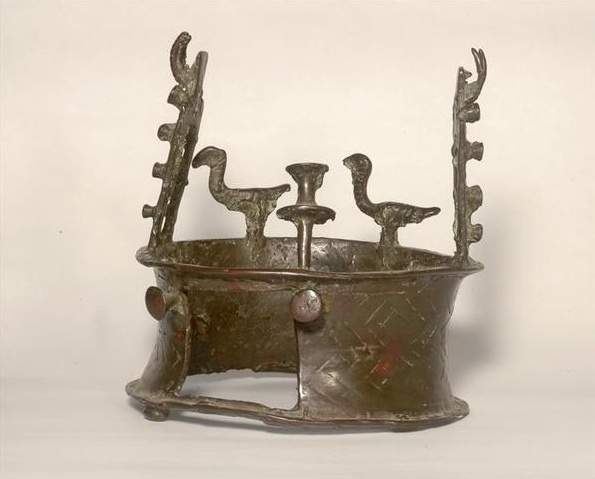 He looked at a small copper cylinder with a square opening like a gate with figures of birds perched on the edge and saw it as a ceremonial miniature of an excarnation site. He also noticed a similarity to round, high-walled structures used by Zoroastrians in Iran and India, known as dokhmas or towers of silence. These are structures used for a process known as sky burial — the removal of flesh from corpses by vultures. The winged scavengers perch on the high circular walls, swoop in when the pallbearers depart and can peck a corpse clean in a couple of hours. Further evidence is a mural showing vultures and headless human corpses several millennia earlier in southern Turkey, where the local Chalcolithic residents are thought to have originated suggesting that excarnation was practiced there. Arav’s answer is that excarnation was used — vultures did the job. To this day there are Griffon vultures and other large birds of prey that swoop above the valleys of the Golan. Arav concludes that Rujm el-Hiri was an excarnation facility. Arav also identified a smaller structure consisting of concentric stone circles on a promontory overlooking the Jordan River as an excarnation site, outer circle is 50 meters in diameter and the inner circle 33 meters. Another round structure was recently identified at Palmahim where only ossuaries were found. It may be hard to come to terms with Arav’s theory given the Judeo-Christian view of honoring the dead and human body but excarnation is practised in other parts of the world and it’s important to remember that the Chalcolithic period predates the Israelites by as much as three millenia. This entry was posted in Archaeology, Tomb and tagged burial, Chalcolithic, Golan, ossuary, postaweek2011, Tomb, vultures on November 4, 2011 by Shmuel Browns. Shmuel, very interesting. (I’m not always staying current with BAR — several months behind at the moment!) The bronze from the “Cave of Treasures” makes perfect sense in the context of excarnation. And, it’s round! There was something very similar in Native American culture in times past, employing poles or elevated racks or platforms.